Cyrus the Great, also Cyrus II (c. 600 – 530 BC) was the founder of the Achaemenid Empire of Persia. He is mentioned in the Hebrew Bible as the patron and deliverer of the Jews. And those who were subject to him, he treated with esteem and regard, as if they were his own children, while his subjects themselves respected Cyrus as their Father ... What other man but 'Cyrus', after having overturned an empire, ever died with the title of The Father from the people whom he had brought under his power? When I entered Babylon in a peaceful manner, I took up my lordly abode in the royal palace amidst rejoicing and happiness. Marduk, the great lord, established as his fate for me a magnanimous heart of one who loves Babylon, and I daily attended to his worship. ... I returned the images of the gods ... to their places and I let them dwell in eternal abodes. I gathered all their inhabitants and returned to them their dwellings. I have given leave to as many of the Jews that dwell in my country as please to return to their own country, and to rebuild their city, and to build the temple of God at Jerusalem on the same place where it was before. 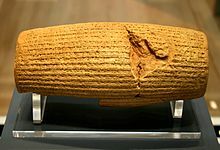 I am Cyrus, King of the World, Great King, Mighty King, King of Babylon, King of Sumer and Akkad, King of the Four Quarters, the son of Cambyses, Great King, King of Anšan, grandson of Cyrus, Great King, King of Anšan, descendant of Teispes, Great King, King of Anšan, of an eternal line of kingship, whose rule Bêl and Nabu love, whose kingship they desire for their hearts' pleasure. When I entered Babylon in a peaceful manner, I took up my lordly abode in the royal palace amidst rejoicing and happiness. Marduk, the great lord, established as his fate for me a magnanimous heart of one who loves Babylon, and I daily attended to his worship. From [Babylon] to Aššur and (from) Susa, Agade, Ešnunna, Zamban, Me-Turnu, Der, as far as the region of Gutium, the sacred centers on the other side of the Tigris, whose sanctuaries had been abandoned for a long time, I returned the images of the gods, who had resided there, to their places and I let them dwell in eternal abodes. I gathered all their inhabitants and returned to them their dwellings. In addition, at the command of Marduk, the great lord, I settled in their habitations, in pleasing abodes, the gods of Sumer and Akkad, whom Nabonidus, to the anger of the lord of the gods, had brought into Babylon. I have given leave to as many of the Jews that dwell in my country as please to return to their own country, and to rebuild their city, and to build the temple of God at Jerusalem on the same place where it was before. 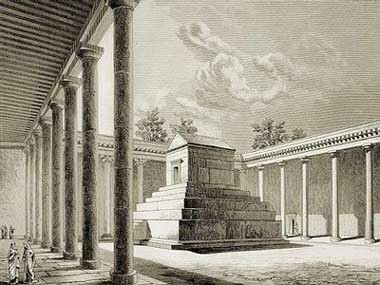 I have also sent my treasurer Mithridates, and Zorobabel, the governor of the Jews, that they may lay the foundations of the temple, and may build it sixty cubits high, and of the same latitude, making three edifices of polished stones, and one of the wood of the country, and the same order extends to the altar whereon they offer sacrifices to God. I require also that the expenses for these things may be given out of my revenues. 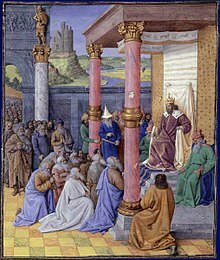 Moreover, I have also sent the vessels which king Nebuchadnezzar pillaged out of the temple, and have given them to Mithridates the treasurer, and to Zorobabel the governor of the Jews, that they may have them carried to Jerusalem, and may restore them to the temple of God. Now their number is as follows: Fifty chargers of gold, and five hundred of silver; forty Thericlean cups of gold, and five hundred of silver; fifty basons of gold, and five hundred of silver; thirty vessels for pouring [the drink-offerings], and three hundred of silver; thirty vials of gold, and two thousand four hundred of silver; with a thousand other large vessels. I permit them to have the same honor which they were used to have from their forefathers, as also for their small cattle, and for wine and oil, two hundred and five thousand and five hundred drachme; and for wheat flour, twenty thousand and five hundred artabae; and I give order that these expenses shall be given them out of the tributes due from Samaria. The priests shall also offer these sacrifices according to the laws of Moses in Jerusalem; and when they offer them, they shall pray to God for the preservation of the king and of his family, that the kingdom of Persia may continue. But my will is, that those who disobey these injunctions, and make them void, shall be hung upon a cross, and their substance brought into the king's treasury. Do what you want, but be prepared in that case to be ruled rather than to rule others... Soft countries breed soft men. For it is not possible for the same land to bear both wonderful fruits and men who are good at war. After being suggested by Artembares, grandfather of Artayctes, to abandon the rocky land of Persia Proper for a better region in the empire. Epitaph of Cyrus, as quoted in Life of Alexander, in Plutarch : The Age of Alexander, translated by Ian Scott-Kilvert (1973), p.326. Cyrus is the only foreigner in the Bible to be identified as the messiah or anointed one of Yahweh, the Israelite God. Isaiah tells us that Yahweh spoke "to his messiah, to Cyrus, whom I [Yahweh] took by his right hand to subdue nations before him" (Isa 45:1). The other people called messiah or anointed one in the Bible aren't designated Yahweh's messiah, as Cyrus is. In scope and extent his achievement ranked far above that of the Macedonian king, Alexander ("the Great") who was to demolish the empire in the 320s but fail to provide any stable alternative. International Committee to Save the Archaeological Sites of Pasargadae.